In a careful analysis of thousands of articles in the peer-reviewed literature on immunology nowhere can we find gold standard, double blind, placebo controlled studies that prove that any vaccine or combination of vaccines can be shown to provide lifelong immunity and safety to any individual. There is an official term used by research scientists and epidemiologists when evaluating vaccines, a term that never makes it to the mainstream media: vaccine failure. Vaccine failure refers either to the lack of effectiveness of the vaccine (primary failure), or the waning of immunity (secondary failure).3 The CDC, the FDA, the vaccine manufacturers, and health care professionals alike bombard us with a barrage of advertising designed to make us believe that vaccines are critical to good health and disease prevention, such that we have lost the capacity to ask the simple and obvious question: will vaccines keep me and my family from getting sick? In this report, we will discuss secondary vaccine failure: The Myth of Vaccine Immunity. The 2010 whooping cough outbreak in California caused 9,100 people to become ill and 10 babies died, prompting officials to recommend an additional booster shot for 12 year olds. So far in Fall 2011, California schools have already turned away thousands of middle and high school students who have not gotten the recommended booster. 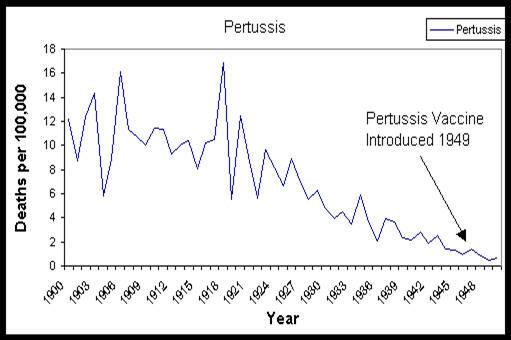 Whooping cough, or pertussis, packaged together with Diptheria, and Tetanus (DtaP), is given according to a robust vaccine schedule of 5 shots by age six, the most of any childhood vaccine: at 2 months, 4 months, 6 months, 15-18 months, and 4-6 years.4 The whooping cough outbreak prompted much hostility and accusation towards parents who chose not to vaccinate their children, along with a clamor to add yet more booster shots. Even adults are now being asked to get a booster vaccine every 10 years. But was the outbreak caused by the anti-vaccine sentiment in Marin County and elsewhere? That question was answered without fanfare during the second week of September with a study showing that the whooping cough vaccine given to babies and toddlers loses much of its effectiveness after just three years. Dr. David Witt, lead researcher and Chief of Infectious Disease at the Kaiser Permanente Medical Center in San Rafael, CA, said in a rare moment of frankness, “I was disturbed to find maybe we had a little more confidence in the vaccine than it might deserve.”5 The study looked at 15,000 children in Marin County, CA, and found that youngsters who had gone three years or more since the last of their five original shots were as much as 20 times more likely to become infected than children who had been recently vaccinated. Dr. Witt, revealing his own pre-study bias, said that when he began the study he expected to see the illness concentrated in unvaccinated children. But what he found was that more than 80% of the children who developed whooping cough were fully vaccinated! So perhaps unvaccinated children aren’t the problem. During January 1--May 20, 2011, a total of 118 cases of measles were reported to the CDC from 23 states and New York City. There were no fatalities. Among the 118 cases, 105 were both “import-associated” and unvaccinated. Of the 87 U.S. residents who came down with measles, 74 were unvaccinated: 39 under age 20, and 35 age 20 and older. 6 The CDC focused heavily on the unvaccinated measles victims while giving no time to the analysis of those vaccinated individuals who also became ill. In fact, 13 of the group (17.5%) had received the MMR vaccine but got measles anyway! While the CDC uses these incidents of disease outbreak to stress the need for vigilant adherence to the vaccine schedule, the real take home message here is that 17.5% of a group of vaccinated individuals got sick despite the vaccine. One thing, however, is certain: the unvaccinated people in this group who recovered (all of them) now have a lifelong immunity against measles. For the ones who got the measles despite having been vaccinated, we just don’t know. Could the vaccine prevent these people from developing the normal lifetime immunity? So far, no researcher has taken on this issue. In 2009-2010 New York and New Jersey witnessed more than 1500 cases of mumps among highly vaccinated groups: 88% of the affected children had received at least one vaccine, while 75% had received the recommended two vaccines. According to Dr. Jane Zucker, NYC Assistant Commissioner of Immunization, “We know that approximately one in every 20 people who are vaccinated may not develop antibodies.” The Reuters reporter went even further, stating, “The mumps virus can mutate, so people who have had only one or even two doses of vaccine remain vulnerable.” 9 How can a vaccine with such negligible long-term immunity not only be recommended, but required for school attendance? Chicken pox (Varicella) is yet another example of a vaccine that doesn't work as well as doctors would have us believe. After one shot of the vaccine, which was licensed in the United States in 1995, about 25 percent of children were still spreading the varicella virus, or getting sick themselves. Anne Gershon, a chicken pox expert who is director of the division of pediatric infectious disease at Columbia University Medical Center, says, "We really need boosters of vaccines much more than we thought we ever would." 10 No one questions this conclusion! How many boosters would be enough? Our vaccines do not confer an immunity that lasts, so to counter this steady waning of effectiveness, more and more and more vaccines are required. So, in 2006, the CDC recommended that a second chicken pox shot be added to the list of childhood vaccines. Gershon says it “looks like” a second shot will keep children from getting sick -- not exactly a reassuring prediction. It is time for us to demand that the makers and proponents of these vaccines answer the question: are these marginally effective and potentially hazardous vaccines even worth the risk? Many parents are starting to think they are not, especially in a case like chicken pox, which generally causes mild disease while conferring the benefit of permanent immunity. The most glaring example by far of a vaccine with limited immunogenicity is the flu vaccine. Created from a combination of strains that have occurred previously, the flu vaccine is given in a type of Russian roulette, with the vaccine makers hoping that one or more of the strains might actually be the one that is most prevalent in any given year. Can they predict success with any accuracy? No. Does the flu vaccine confer any long-lasting immunity? Hardly. If it did, the CDC would not be recommending since 2010 that everyone over the age of 6 months get a flu shot every single year. On the subject of immunity, all the CDC is willing to claim is that the flu shot will last throughout the entire flu season, which is considered to be December through March – a mere 4 months! The evidence is overwhelming that vaccines lack the ability to confer a long-lasting immunity. Despite such evidence, however, the deck is clearly stacked on the side of the pro-vaccine CDC, FDA, and vaccine manufacturers. It seems anti-American and anti-science to be skeptical of the long-term benefit of vaccines since there seems to be such unanimity of opinion, both from the powers that be and the media. Too many Americans unquestioningly roll up their sleeves for everything the CDC recommended without considering the consequences. They want us to believe that there are no simple answers to the question of whether natural immunity caused by exposure to a germ is better than the industrial version. In fact, there are simple answers, obvious answers – but no one wants the public to stop and think about the fact that vaccines cannot be counted on to produce a lifelong immunity, while natural immunity can. Prior to the development of the 36 childhood vaccines that we currently give to children under 6, it was common and expected for children to get measles, chickenpox, mumps, and German measles (Rubella). These childhood diseases spread through a family, a school class, a neighborhood, usually causing annoying but relatively minor illness with a few days off from school, and then the child would recover and be immune for life. Parents actually went out of their way to expose their children to the diseases so that they could get them over with: they weren’t afraid of their children getting sick. So what happens now? Changing the Paradigm – Are We Crippling Our Immune Systems? Since widespread vaccination programs against these diseases began in the 1980s and 1990s, there tend to be fewer outbreaks of illness. But the illnesses are more severe and unexpected. Despite the reduced number of cases, proportionally more of these lead to serious illness and death. And the demographics have completely changed. Instead of the 7-10 year olds getting the mumps, it is teenagers who are currently the most affected. Likewise, instead of the same 7-10 year olds getting the measles -- the traditionally affected age group for decades -- many of the current patients are infants, who are much more likely to die from infection with the virus. Measles is especially hazardous in infants because of the risk of complications: between a quarter and a third develop some related problem, such as diarrhea, ear infections, pneumonia or encephalitis. Babies used to be protected from disease through maternal antibodies, but this wonderful mechanism of the human immune system is being destroyed by vaccines. If we remain on the current trajectory of exponentially increasing the numbers and types of vaccines given to both children and now to adults, will we reach the point where we no longer have natural immunity at all, thus becoming completely dependent upon short-lived, meager vaccine immunity for our very survival against disease? Why Aren’t Vaccines more Immunogenic? What is lacking in our current method of vaccination is a way to stimulate the entire immune response instead of just a portion of it. Normal exposure to pathogens always begins in the nasal, ear, throat, and respiratory passages, never through injection. Once primary immunity has been established by infection, the antibody response follows. This allows the immune system to grow stronger and learn to bestow natural and permanent immunity to an ever-increasing number of pathogens. Vaccines injected into the body bypass cell-mediated immunity and overstimulate humoral immunity. This confuses the normal maturation and skews the functioning of the immune system. Humoral immunity becomes dominant and the crucial cell-mediated immunity is suppressed: the result can be autoimmune disease and frequent infections. Research shows that vaccinated children, compared with unvaccinated children, suffer from five times more asthma, three times more allergies, three times more ear infections, and four times more recurring tonsillitis. So now disease outbreaks create panic and fear when they occur, followed by rage against the irresponsible parents who don’t vaccinate their children for having created the problem. The argument from the pro-vaccine camp is that there wouldn't be any cases of measles at all if every child were vaccinated. As we can clearly see from the above examples, this argument simply doesn’t stand up to scrutiny. The gold standard of scientific study requires a double-blind, placebo-controlled, randomized trial to isolate the effects of one particular intervention. In order to evaluate vaccines properly, it would be necessary for vaccine makers to take every vaccine on the market and compare a group of vaccinated individuals with a group of unvaccinated individuals under the above conditions to ascertain whether vaccines were effective and provided lasting immunity. This type of study has yet to be done. Nor has a retrospective analysis of vaccinated vs. unvaccinated individuals been undertaken. Why not? The possible result might be that we find we have been sold a bill of goods about the long term immunity and effectiveness of vaccines. The vaccine industry falsely claims that its vaccines work exactly the same way as active immunity. As we have shown, vaccines do not produce the same quality and strength of antibodies that one’s own body would produce from a natural infection and recovery, nor do they initiate cell-mediated immunity. There are two major types of vaccines: inactivated/killed and live attenuated. Inactivated/killed vaccines are inefficient because some of the antibodies will be produced against parts of the pathogen that play no role in causing disease, and some of the antigens contained within the vaccine may actually down-regulate the body’s adaptive response. Also, vaccines of this type do not give rise to cytotoxic T cells which can be important for stopping infections by intracellular pathogens. Live attenuated vaccines may cause the illness they are designed to protect against either because they revert to virulence, or because for some individuals they aren’t sufficiently attenuated.20 If vaccine protection fades over time, then people are being persuaded to risk their health for a dubious benefit. 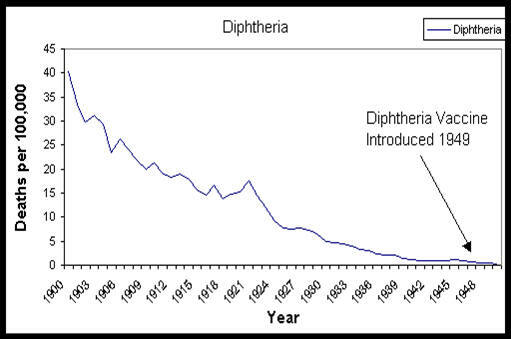 What Actually Caused the Decline of Major Viral Diseases? 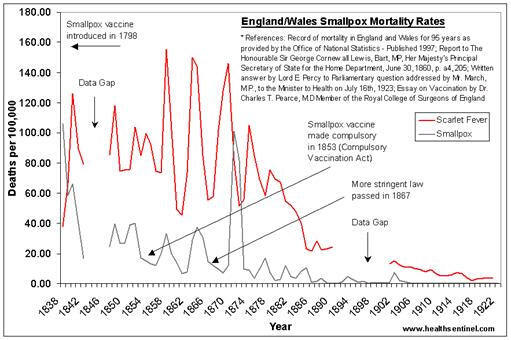 Looking at the raw data from England during 1838-1922, 23 as shown in the next figure, we see that despite enforced vaccinations against smallpox, there was no significant decrease in deaths from the disease. In fact, three major epidemics during 1857-1859, 1863-1865, and 1871-1872 occurred, even though there was a high vaccination rate. The last major epidemic in 1871-1872 had death rates of 101.2 and 82.1 per 100,000 people respectively, occurring just four years after a newer and more strict vaccination law was enacted in 1867. Public health interventions such as good hygiene measures, isolation, and physical barriers have a much better evidence base than vaccines. The data suggest that implementing such measures are effective and relatively cheap interventions to contain epidemics of respiratory viruses, with estimates of effect ranging from 55% to 91%!25 Yet little discussion ever appears in the press to help people understand the measures they can take to best protect themselves against viral or bacterial disease, aside from vaccination. In fact, our reliance on vaccination in the US may have the effect of breeding feelings of invulnerability – therefore ignoring simple hygiene measures – while the encouragement of early treatment with antiviral drugs leads people to show up at the hospital at the first sniffle, thus magnifying the possibility of disease spread. Despite the decline in major viral diseases, there is a concern now whether these diseases are making a comeback, as we see from the recent outbreaks of whooping cough, measles, and chicken pox. Could this be due to the fact that, instead of lifelong immunity, what we have now for people younger than the Baby Boomer generation is an artificial immunity based on vaccines whose efficacy wanes over time? Meanwhile, we are being deluged by the propaganda that tells us unrelentingly that we must subject our children and ourselves to multiple and frequent vaccines to save us from disease, and we fall in step with the program. Vaccines are a huge business – pharmaceutical companies are inventing new vaccines every year, all with the hope of their being included in the mandated vaccine schedule, thus generating billions in profit on an ever-increasing basis. Unless parents sign exemption forms, children must be vaccinated before they can get into school. This is the law, and legislation is controlled by lobbying, with the pharmaceutical lobby being at least the second most powerful in Washington. Vaccines are also the cornerstone of all the “well baby” programs, and so fuel the livelihood of the entire pediatric industry. Increasingly, the well baby program has morphed into a well-adult program. As diseases previously confined to childhood are affecting adults with no naturally derived immunity, we are all being pressured into getting more and more vaccines. Is there no surprise, then, that there are never any follow-up studies by the manufacturers about long-term effectiveness of vaccines? It would hardly be in their interest to do a study that might end up proving the worthlessness of their products and the permanent damage to our immune systems. 3. Peltola, H, Mumps Outbreaks in Canada and the United States: Time for a New Thinking on Mumps Vaccines Clinical Infectious Diseases, Volume 45, Issue 4, pp. 459-466. 4. MedicineNet.com, MedicineNet, Inc. - Owned and Operated by WebMD and part of the WebMD Network . 8. Barskey AE Mumps Resurgences I the United States: A Historical Perspective on Unexpected Elements. Vaccine. 2009 Oct 19;27(44);6186-95. 9. Julie Steenhuysen, Reuters, February 11, 2010. 10. National Public Radio, “Lifelong Immunity? With Vaccines, it Depends.” October 11, 2010, Nancy Shute. 12. Leuridan E, Early Waning of Maternal Measles Antibodies in Era of Measles Elimination: Longitudinal Study. British Medical Journal;340; Published 18 May 2010. 14. Vaccine Risk Awareness Network (VRAN), “Vaccination: the Basics,” January 2011? 17. McElhaney JE, T Cell Responses Are Better Correlates of Vaccine Protection in the Elderly. The Journal of Immunology. May 15, 2006 vol. 176; no. 10; 6333-6339. 25. JeffersonT, Physical Interventions to Interrupt or Reduce the Spread of Respiratory Viruses: Systematic Review. British Medical Journal 2009 Sep 21; 339.